Dive into the unique and fascinating history of a true Renaissance city with this 5-hour walking tour of Ferrara. Learn about the 300 years of rule by the Este family. See some of the monuments in the historic center, which helped get the city onto the UNESCO list of World Heritage Sites. Make your way to the appointed location in central Ferrara to meet your guide and begin your walking tour of the city. 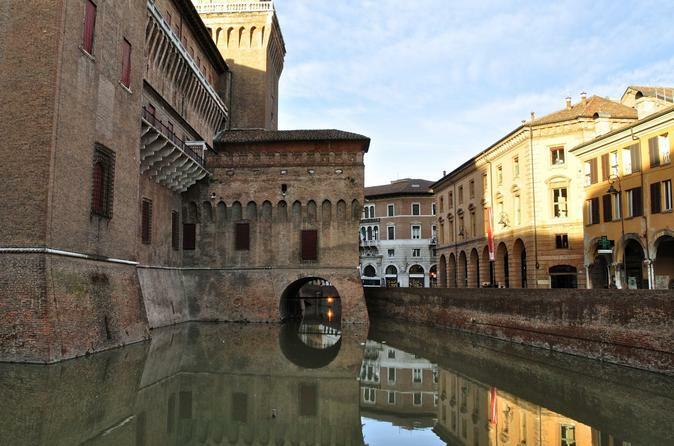 Stroll through the picturesque streets to see many of Ferrara's main sights. See the outside of the city's impressive Castello Estense and visit the inside of the Romanesque cathedral. Walk through the Jewish Ghetto. Hear about the Este family, who ruled the city for about three centuries, and helped Ferrara become the 'modern,' planned city you see today – including merging Medieval and Renaissance styles in a harmonious fashion. After a stop for lunch (own expense), choose a visit to either the Schifanoia Palace to see its gorgeous frescoes, the monastery of St. Anthony in Polesine to see its mysterious 14th-century frescoes, or the National Art Gallery's collection inside the Palazzo dei Diamanti. If you like, later you can even rent a bicycle (own expense) to pedal your way along Ferrara's beautifully-preserved city walls.